Bullhorn CRM Review: "Okay but no back office." [It's] Used as an ATS and CRM across the whole organization. Used to organize candidates, employees, prospects, and customers. Partially replaced a previous ATS/CRM. A lot of customization available. Can post jobs easily (integrates with several job boards). No back office function to pay contract workers. Difficult to track multiple branches. Tends to lump info together. Reporting can be difficult due to the tracking issues. A lot of manual work to pull clean data. Bullhorn CRM Review: "Bullhorn-Your go to ATS/CRM"
Bullhorn is currently being used by all of our Recruiters, Account Manager and Client Services for recruitment and job order management. 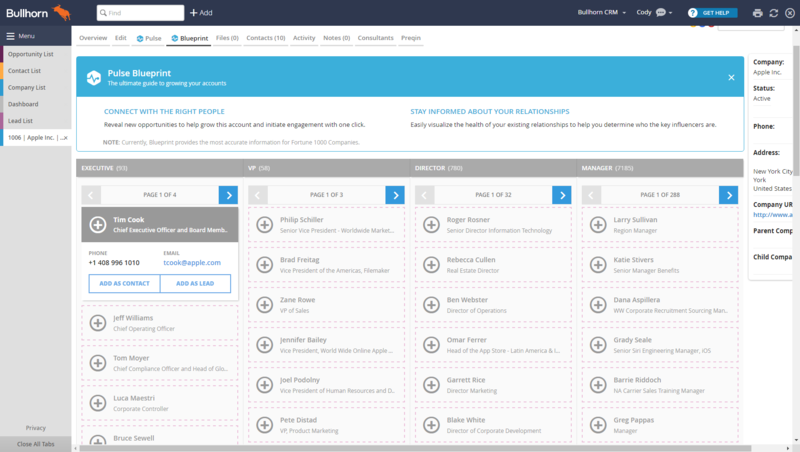 We also have implemented the CRM component for the prospecting component of client acquisition. The ATS is used extensively for all stages of job order management and talent acquisition. Bullhorn helps to standardize the process and track the progression of roles and candidates. This enables consistent reporting across the organization so as a team, you can look for areas of success and areas that require improvement. Candidate Management- it is very easy to track and search your candidates. Candidates are the heart of your ATS in staffing and Bullhorn does a great job of making those candidates accessible. Job Order Management-Being able to keep your job orders managed in a way that keeps you closest to money is a one of the best parts of the system. You can filter your lists, schedule your followups and keep on top of the orders that are the most urgent. Configuration- the ability to configure the tool to the look and feel that matches your business. Bullhorn CRM allows Account Managers to do their prospecting without cluttering the Company and Contact List with Company and Contacts that are not buyers or individuals that do not using staffing, not decision makers, etc. Leads allows AM's to pursue those individual within a different entity until they are vetted as buyers. The opportunities allow you to track those longer range opportunities versus storing them in a notebook or on an excel document. They become company IP for down the road. Configuration of the CRM is huge asset. We have changed and configured our workflow several times over the past few years until we have decided on the workflow we want to move forward with. The tool allowed us to make these changes as we saw fit and without the time and cost of having to go through a PS channel. 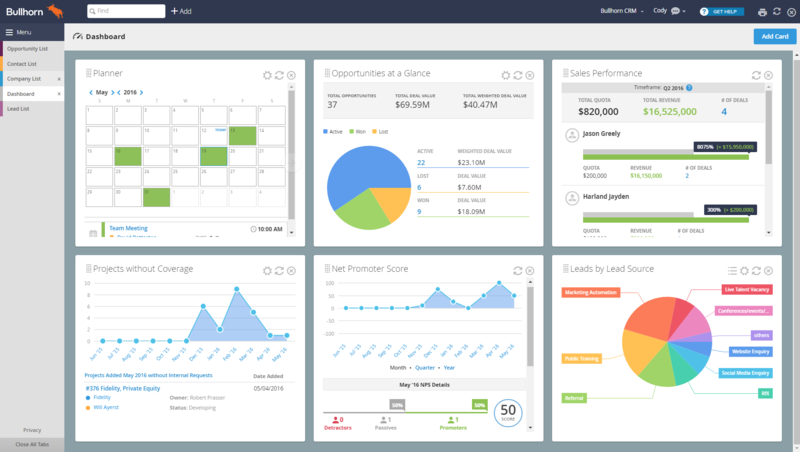 The Lead and Opportunity dashboards help to keep you on track in a visual way so you can see the time cycle of your leads and opportunities. Submission Management- Although there is a submission entity in Bullhorn that allows you to do a lot of things, this is one area that could still use improvement in terms of the ability to search web responses more efficiently and displaying of the pay/bill rates that are entered within the submission process. More configuration here would be great. Bullhorn is well suited for any staffing organization. They continue to invest in and listen to their customers for ways to continually improve their product and to make changes that enhance the user experience. The ability to configure and customize the work flow for your organization is key, and a lot of that can be accomplished out of the box. Bullhorn CRM Review: "Bullhorn Rocks"
We use Bullhorn CRM across our whole organization. It addresses the problem of keeping our candidate, client and job orders organized. It gives us a central location to find candidates for job searches, interact with the candidates as well as clients. It keeps records of all contact with clients and candidates. I would like to be able to create my own specific report and not have to rely on the ones created. I have used 2 other CRMs and Bullhorn is my favorite. For the staffing/recruiting industry, Bullhorn does a great job of keeping up with records and parsing resumes. I especially like the Bullhorn for Email function. Very easy to use and I don't have to copy and paste emails, Bullhorn does that for me. We use Bullhorn CRM for recruiting and sales, we use the recruiting tools within and we use it to track our candidates from submittal to hire. It is also used for reporting, note keeping, and generating new leads. It is very effective for organization purposes but the recruiting is a bit weak in my opinion. Recruiting - I think it is hard to filter through searches as each canddiate just shows the name of the candidate and their job title, highlighting is not shown when the candidate is opened up. Bullhorn CRM is well suited for keeping track of candidates when entered into the system. It is less appropriate as the primary source for recruiting efforts. User Review: "Bullhorn CRM - A great recruiting tool"
We are currently using Bullhorn CRM across our whole agency. It has definitely increased efficiency and teamwork across the board. There are many features that help the recruiters access information and files at a faster pace. They are able to make a submission to a placement in record time. The notes features really helps keep us all on the same level of information and knowledge of how our current and active candidates are doing as well as our prospective candidates. Notes features is a real hit with our recruiters. Merging records whether it be duplicate jobs or candidates helps minimize duplicate information. Everything is well connected, for instance a client will show all of the open jobs. There are a lot of small features I would like to see as an admin such as bulk update en mass on occupation for users. The limit to the amount of "Customtext" options under field mapping could be higher. I would like more options to generate different types of report in different formats. While our recruiters are speaking to prospective candidates they can create appointments and tasks while they are on the phone, it really ups the multi tasking and information sharing. We can view all tasks, and appointments from all users so we can synchronize and help each other out more efficiently. Bullhorn CRM Review: "Big Fan! Love it!" It is used by our whole organization. I, specifically, use it in recruiting. Bullhorn addresses job pipeline; organization; creating, maintaining, and managing task lists, and so much more. It helps recruiters to stay on track of jobs, manage the candidate experience, and even helps to identify which partner relationships need nurturing. It definitely helps to keep things moving along. It is very well suited for a team of recruiters - both contract and direct hire / permanent. Dashboards are great for management and individual performers. It is well suited for any recruiter that is tracking multiple jobs, potential leads, and desires to really manage the customer experience. it's especially great for teams because everyone can see the notes added. Our whole organization uses Bullhorn CRM and its helps our organization with creating, maintaining, and managing task lists, and so much more. It really helps with both recruiters and sales associates to keep track of our consultants and job tasks at hand. It is a great tool for pipelines, and keeping tasks on candidates and clients. Bullhorn addresses job pipeline; organization; creating, maintaining, and managing task lists. Bullhorn helps me to manage my daily activities. Bullhorn helps us keep track of all of our current job reqs, consultants and possible leads which all associates can view! Bullhorn Pulse is an awesome tool as well. Been having some issues with login, but I'll take that con since everything else is so awesome! Bullhorn is a great tool for containing all information needed for our firm to work efficiently. We would honestly be lost without it. I am glad that our company uses this tool and I would highly reccomend Bullhorn CRM. Bullhorn CRM Review: "Bullhorn; blummin' brilliant"
We use Bullhorn across the whole of Pentasia and Ambra. We have the database configured so that only on users in their respective departments (i.e. Pentasia or Ambra) can see records specific to their brand. Bullhorn allows everyone from consultants to senior management and the board to see activity, which jobs are being worked on currently, any records which have been added recently, and other useful information. This means we are able to understand our pipeline over the coming months, if we are bringing in new business (or need a BD drive). Bullhorn also prevents awkward conversations where consultants are asking the same questions - all the information is there for everyone to see ! Bullhorn is really intuitive, there is so much capability, but as the database is so easy to use this isn't a problem. The support team are fantastic; I can't praise them enough. I raise so many tickets and they always do their best to help. We have customised our database a lot and integrated various partners to help us be the best we can. Bullhorn has always been able to cope with our demands and help us progress as a business. It would be useful to have more custom fields available. On placement records, the commissions are automatically split 50/50 - something which bugs our consultants as we often need the commissions to be set to 100% for reporting (unless there is a split). It would be good if we could have the option of filtering by ex-users. In the general recruitment process, Bullhorn provides enough depth to get a fully rounded view of what is happening. It is possible to get a quick overview of any record from the list view (and en-mass) which can be a time saver. I am aware Bullhorn has brought out their own reporting function, but sometimes when wanting a quick snippet of information, this can be difficult to obtain. For example, I was asked if it was possible to see all interviews logged by an ex-user, this wasn't so easy to find. Bullhorn CRM Review: "Bullhorn: ATS/CRM leader"
Bullhorn is currently being used by all of our recruiters, account managers and client services for recruitment and job order management. We also have implemented the CRM component for the prospecting component of client acquisition. The ATS is used extensively for all stages of job order management and talent acquisition. Bullhorn helps to standardize the process and track the progression of roles and candidates. This enables consistent reporting across the organization so as a team, you can look for areas of success and areas that require improvement. Configuration - the ability to configure the tool to the look and feel that matches your business. Applicant/Candidate Management - All aspects from 1st contact to placement follow up are easily tracked and accessible. Requirement/Job Order Management - Status and action on jobs and requirements are easy to track and update as needed. UI customization would be a huge benefit. More floating windows and drag and drop options for users who need to minimize visual "noise". Bullhorn is well suited for any staffing organization. They are progressive and open to change as the industry needs change. It leads the way in configure and customization options which keeps things organized. Bullhorn CRM Review: "Thumbs Up"
Bullhorn is used by the recruiting and sales team daily, across North America. Keeps candidate files organized and searchable. Allows management to easily track our stats. Makes it easier to work as a team because you are able to see what your coworkers are doing and avoid duplication of efforts. Allow companies to personalize more, there is so many text boxes that we never use, and we do not need half of the information that the system asks us for. It is great for tracking candidates and making their information searchable. I love the Resume Wizard feature, it makes adding candidates that much easier. Bullhorn CRM Review: "Great CRM. Works well with Staffing & Recruiting industry." We use Bullhorn to manage a majority of our business needs. We use the CRM features in business development as well as client retention. Bullhorn is what we use to track candidates and the entire recruiting process for our clients. Bullhorn also offers back of the house features that we use from time to time. Easy to convert leads to real sales opportunities and eventually convert the opportunities into jobs. All of this is done seamlessly with little to no duplication of content. Reporting can be exported to Excel. Searching databases can be clunky at times (certain contact searches don't always return data from lead database). Bullhorn CRM is good at keeping prospect and contact information up to date. There are many plugins that help simplify processes. We have Shoretel VOIP telephone system - there is dialer plugin that dials contacts by clicking on their telephone number in the Bullhorn record. The dialer plugin also prompts to add a note to record a summary of the call. Bullhorn CRM: "Bullhorn Review from a Search Firm Perspective"
Mee Derby is an Executive Search firm and has been a bullhorn user for 12 years, we use it to run our business. We are a team that is geographically dispersed and Bullhorn allows us all to work remotely and communicate in real time in reference to both our clients and our candidates. We have been been extremely happy with Bullhorn and the fact that the tool is scaleable for our needs. Highly recommend Bullhorn to any client looking for a new ATS. Easy to manage open jobs orders and track activity against those jobs. Easy to add new data both on the client and candidate side. Still feel that there needs to be improvement on search capabilities. Longterm would like to see a seamless integration to invoice our clients through Bullhorn. Feel that it is well suited for organizations of all sizes. Bullhorn CRM Review: "Bullhorn for Recruitment!" Bullhorn was being used by the entire organization. As a staffing firm, this was our database tool for storing all things recruitment and every resume and job we came across.This tool addressed the problems of recruiting and resume database management as well as having one unified tool to store all the jobs we were assigned as well as new and existing clients. We used it daily for tracking emails and communications as well. Resume Storing, easy to parse a resume and auto fills many categories. Duplicate checks so that we can have a clean software and know who is a duplicate or not. Searching features for finding candidates that are already in the software. Reporting features could be improved. So many glitches, the software freezes very often and you have to refresh the page and lose your information. Bullhorn is definitely suited as a recruitment database and software as it stores resumes, jobs, candidates and clients. It is good in my opinion for a small or medium sized organization. For larger organizations, I feel there is too many glitches that occur and errors that it takes sometimes more time to add a job or candidate into the software than it did to find the candidate for the jobs. Bullhorn CRM Review: "Bullhorn Meets Our Needs"
Bullhorn is being used across our firm to keep track of candidates in the process for our recruiting engagements with clients. It helps us keep track of process steps and data associated with jobs, candidates, clients, and companies we work with. We also use it as a database to access prior candidates for new searches. The modern looking display is fairly intuitive and easy to use. The mobile functionality looks and feels identical to the computer based interface. It is easy to view and add content. The customer service is US based, friendly, knowledgeable, and follows up. We had to do a bit a creative thinking and customization to make the system work for a retained model. I felt like the out of the box system was set up for temp placements or contingent firms. Bullhorn CRM Review: "Reliable System"
I work at the largest IT staffing agency in Canada. I use Bullhorn(BH), every day. This product addresses the problem of competing priorities, by making me more efficient, and able to multitask. Plus the fact that it's web based means I can log on anywhere! I love the user experience. The password has to be really long. Recruiting, vendor management, client management.... appropriate for everyone in a sales job. Especially staffing. Bullhorn CRM Review: "Bullhorn- Potential is there"
We use Bullhorn as our complete record for all contact with both candidates and clients. The software has a lot of useful tools that helps eliminate a lot of time-consuming events, but on the same knot, can often be lagging in many areas. Since 2017, they have added many new additions that simplify the information-recording process. Email client is external and must be used by Gmail. The internal email feature was removed from the software (unless you mass mail). The software is a little clunkly, and although it's a newer version, it seems a bit outdated. While the platform is web-based, it fails to run smoothly through a mobile platform, and often times, the loading times are a little sluggish. Bullhorn CRM Review: "Great Application for Staffing"
We currently use Bullhorn as our ATS and CRM. We are a small company and having come from Maxhire, a very robust ATS/CRM, it took us a bit to adjust to using an online ATS/CRM, but we have and Bullhorn has been a helpful resource for us. Parsing incoming resumes is a great feature. The Bullhorn ATS makes it super easy to get your candidate's information into the system. Bullhorn Outlook Gadget works from inside Outlook to let you easily add resumes or other documents to records in Bullhorn or create new records. It works great and has made this process so much easier for our team. The API that Bullhorn has available is a great way to automate some of your processes if you know how to utilize it. Bullhorn also provides some detailed instructions for other admins like me who want to learn more about it. Support - Bullhorn's support team is phenomenal. They constantly go above and beyond my expectations to make sure any issues are resolved. Editing resumes from within Bullhorn is not something they do, but it was something we had in our last system and it has been hard to adjust to not having this. This is a key feature that would keep us from having to constantly download the candidate's [information]. Bullhorn does allow for a good deal of customization to workflows and fields which Is great, but you need an administrator that's up for the challenge of scouring different Bullhorn articles to learn the best way to customize and configure your version of Bullhorn. Bullhorn CRM Review: "Bullhorn is not just full of Bull****"
It does a good job of housing candidates details and linking them to open job opportunities the company has. It does a good job of integrating with lead generation tools like DiscoverOrg so you can parse data into the system, avoiding data entry. I like the UI layout, it is easy to follow and find information you need. It does a good job running reports. I would love to see the notes section have an option to configure it to scrolling notes, this way you dont need to open a new tab whenever you would like to see a new note. I would like to have an option to back date notes in Bullhorn if you forgot to enter them. There may be a way to do this but I have not figured that out yet. Bullhorn is very good as an applicant tracking system. It is not as strong when it comes to sales or account management. It is not set-up to function as a sales CRM, more of an ATS. I find on the sales side I would like to see more options, including integration with MS Outlook. 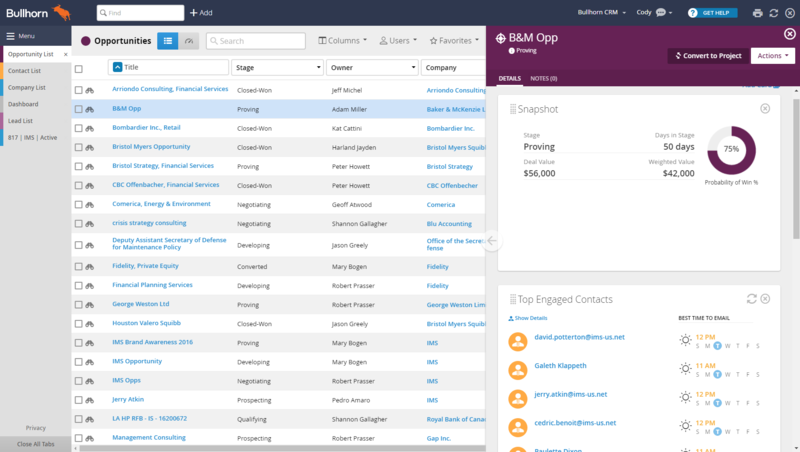 Bullhorn CRM Review: "Easily customizable, very affordable, scalable"
Here at LOOP, we use Bullhorn as our applicant tracking system and sales CRM. It is used across the whole organization. Bullhorn CRM is well suited for staffing and recruiting companies. It is being used by everyone in our company. We use it to generate new business and new consultants. Also for our metrics. It is good for small to medium corporations. This way everyone is entering in data and you have clients you can contact from different cities. Also very good with notes. Bullhorn CRM Review: "Comprehensive Design"
As a staffing agency, our entire organization uses Bullhorn CRM. Bullhorn is our main recruiting tool allowing us to easily manage sales leads, candidate leads, and all levels of the staffing process. It effectively addresses the time issue; this tool saves us a great deal of time by organizing each of our processes in a general tab format. Organization - The layout of the Bullhorn interface is simple. This makes training new users easy and makes working in bullhorn stress-free. Detail - Bullhorn allows us to enter and retrieve a great amount of detail within records. This allows for accurate reporting and follow-up. Customization - Bullhorn is very customizable. We can easily add components and fields to the interface within each function of the CRM. User Interface - Though highly customizable, the windows and popups can be quirky. The sizes of windows, for example, can sometimes be too small for the data contained and require a great deal of scrolling to navigate through. Email Capability - Bullhorn would be better with a full-service email suite which included all of the functions of MS Outlook for example. Data speed - We all want to work faster. Bullhorn can sometimes be a bit sluggish with the transmission of data. Bullhorn is well-suited for the onboarding of new employees. I am able to enter and store detailed contact information and sensitive personal data about each candidate. I can make notes and store new hire documents related to the onboarding process. Bullhorn is also well-suited for specific data retrieval. I run monthly reports to extract current employee detail in order to determine eligibility for employee benefits. By keying in a few date parameters, I'm able to see an accurate list of eligible employees. Bullhorn CRM Review: "Admin Support using Bullhorn"
In my capacity at Procom as admin support, I use Bullhorn every day to manage contracts for our consultants. For example when I get notice of an extension from our client for a consultant, we're able to keep track over many years of data for pay increase and previous documents. This allows us to keep things organized for our own files, as well as make sure all the requirements are being met for our client. The whole organization uses Bullhorn for many other tasks offered by the software. I understand that recruiters use Bullhorn for job posting and other functions. I believe we also use Bullhorn at our other locations throughout Canada. A curious problem we face today in this sort of industry of playing admin/customer support for our clients is the issue of security. This often comes up on the onboarding process. Consultants are very careful who to give out their information to, but as it is a business requirement, it proves a difficult problem. Especially when you face the problem of trying to have a backup of your internal files. Bullhorn addresses this concern by storing information securely away from our own internal database in case anything were to happen to a hard drive. It's well suited for keeping files of our consultants and gives us the ability to pull data. To be able to keep track of everyone by the thousands (for my department alone) is an immeasurable help. This may not be suited for other businesses and fields... unless they really like creating data. Bullhorn CRM: "Procom Bullhorn Review"
It is used across the whole organization to streamline recruiting and sales communication and tracking. Ease of communication between sales and recruiting. The search bar is not very intuitive. A chat feature in the app would be helpful. It is well suited for sourcing candidates and creating tear sheets for certain roles you may need to revisit later. Bullhorn’s CRM software is a web-based solution built for companies that need to closely manage and nurture prospect and customer relationships. Bullhorn provides comprehensive CRM functionality whether the user is a consulting firm that needs relationship management insights and detailed lead/opportunity reporting or a PR firm that needs internal reporter management capabilities and greater visibility into pitch effectiveness. Mobile-ready and available in any browser, Bullhorn CRM offers users the flexibility to work anywhere, anytime and on any device. 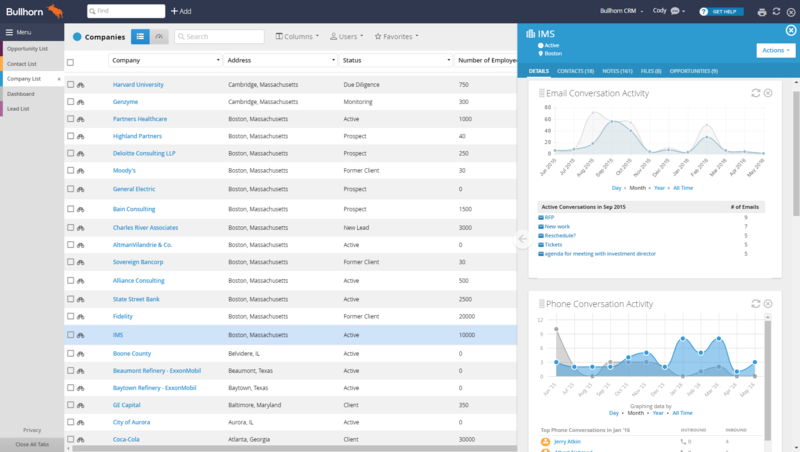 Bullhorn CRM also passively tracks email activity, pulling key contacts and communications into the application. With the Bullhorn Accelerator, users can copy information from any webpage and pull it into the Bullhorn application. Bullhorn CRM also provides an open API upon which organizations can build and integrate business-critical tools and apps.